Well it's two days post op, give or take, and things have moved on slightly. Betsy and I have become close having lived in each other's pockets for 15 hours. I have learnt that rabbits never close their eyes and they "sleep" (with eyes open) for approximately ten minutes at a time. Usually waking up the instant you stop looking at them. I also have a strong feeling you cannot train a rabbit to do much. Certainly not to stop licking their stitches. The nurse rang again yesterday to check she was alright. I regaled her with tales of 'bunny watch' whether she was interested or not. She suggested finding a dolls t-shirt which we all found hysterical, but clearly we tried anyway. What the heck. The girls agreed to give up an old dolls t-shirt which does up with velcro. We wrestled her into it. She jumped out with quite alarming speed. Perhaps it was a bit dull for her. Tilly suggested drawing a basketball on the front. Paul pointed out it was miles too big so then the tailoring began. I can only say Peter Rabbit's mother must have had excellent sewing skills. 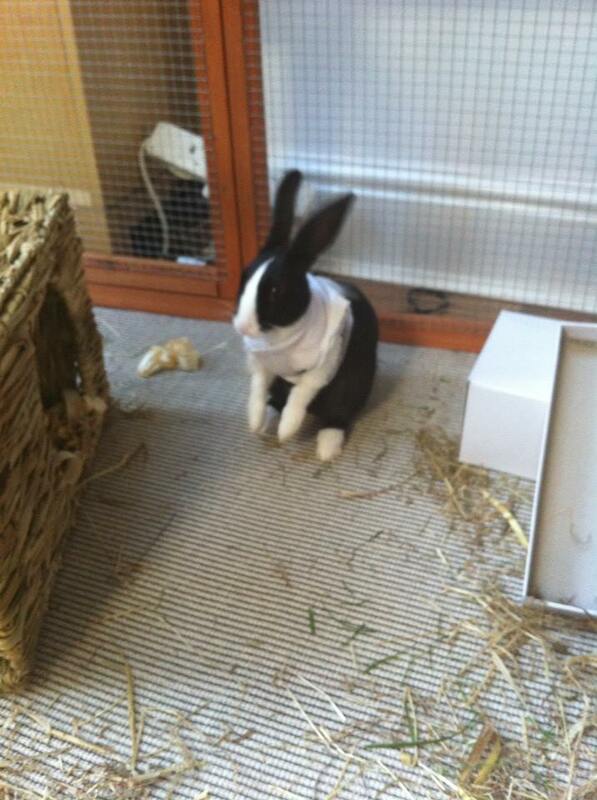 I don't have paws and I found it hard to fashion a coat that the rabbit couldn't get out of. It's no wonder she was cheesed off when he didn't come back wearing it. We cut bits off, inserted darts (sort of) and ended up with something that looked like a cross between a Michael Jackson outfit (cue Tilly breaking into "Heal the World" for the billionth time), and Matthew Wilder's leather jacket ("Nobody gonna breaka my stride..."). It was on and it looked natty. I didn't bother with brass buttons. Then we went about our business and eventually went to bed. This morning Paul went to check on her and...drum roll...she was just in process of taking it off. It was like she'd waited all night to reveal her escapology skills in front of an audience. I'm worried all this attention is going to her head. So I've sewn it up again and added bits on. She's been back to the nurse who basically seemed impressed with our efforts and said to try and keep it on her for five days. We have not a hope. I think she'll get faster at removing it as she gets more practiced. I suspect I'll need several on rotation. On the upside by the end of the week my sewing skills will have improved and she will have moved on in sartorial elegance to be wearing some patchwork garment made out of colourful offcuts. Like Betsy and her amazing technicolour dreamcoat. I can hardly wait.